Our devices provide the holder with an awful lot of personal and private data if they were to get a hold of it and get access to it. And it's happened to all of us. We've misplaced our device, or worse it was stolen. 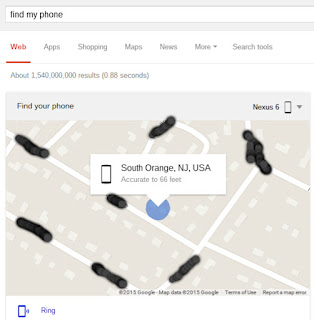 Everyone seems to be aware that Apple (sorry for mentioning them) provide iOs users with Find My iPhone, an easy way to locate, lock, and/or wipe the device in the instance of misplacement or theft. 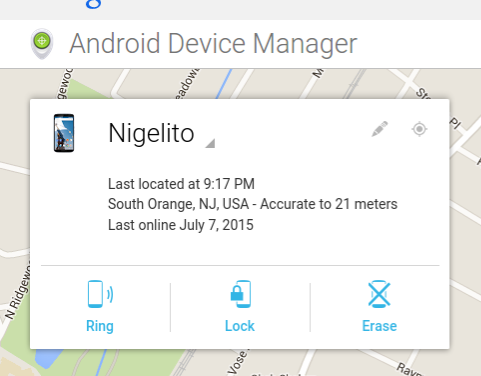 It seems many people are not aware that Android provides a very similar service through the Android Device Manager. But having a service like this is useless if it is not setup and activated. Setup is rather simple and is done right from the device itself. Just go into the device settings>security> and under Android Device Manager, simply turn on the switch for Remotely locate this device and Allow remote lock and factory reset. Next, make sure that location access is turned on under settings>personal. A really neat option is that you can use chrome to find your device by typing into the browser Find my Phone. From here you have the option to Ring your device. If you have more than one device, you can easliy choose from a drop down another device to find, ring, lock or erase. You can also download an app to perform these same tasks from your tablet or phone from the play store. What would be great is if Motorola required a PIN to turn off the Nexus 6, like it requires when turning it on. I had an older model Nexus that was stolen from me and the thief turned off my phone before I could do a search through Google or ping it from my Motorola Keylink. Thank you for all of your tips and tricks! That is actually a good idea. Glad you enjoy the posts.